Moringa / Moringa oleifera | Infonet Biovision Home. 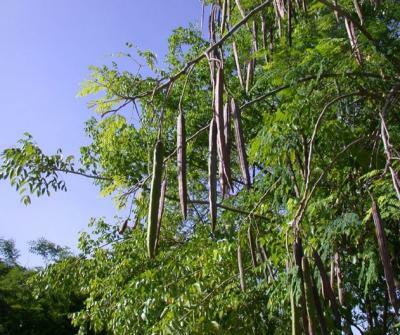 Chonyi (Muzungwi); Daasanach (Hocholoch); English (Drumstick tree, Moringa); Giriama (Muzungi, Muzungwi); Kambe (Muzungwi); Sanya (Muzungwa); Swahili (Mrongo, Mzunze); Tharaka (Muguunda). Given its importance, M. oleifera is widely distributed and is found in India, Malaysia, Oman, Qatar, Saudi Arabia, United Arab Emirates, Yemen, Republic of Afghanistan, Bangladesh, Benin, Burkina Faso, Cameroon, Chad, Eritrea, Ethiopia, Gambia, Ghana, Guinea, Haiti, Indonesia, Iran, Kenya, Kiribati, Liberia, Mali, Marshall Islands, Mauritania, Myanmar, Nepal, Niger, Nigeria, Northern Mariana Islands, Pakistan, Philippines, Senegal, Sierra Leone, Sudan, Tanzania, Thailand, Togo, Uganda, Vietnam, Zanzibar. 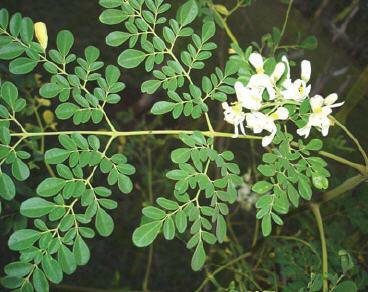 M.oleifera is most productive in drier seasons and the leaves turn yellow in rainy seasons. Every part of this tree is valuable and this explains why it is the most endangered tree species in the country. Soil type: A adapted to a wide range of soil types but does well in well drained clay or clay loam without prolonged waterlogging. Prefers a neutral to slightly acidic soil reaction, but it has recently been introduced with success in Pacific atolls where the pH is as high as 8.5. Moringa is an extremely fast-growing tree, and within 1-3 months trees reach 2.5 m. Constant pruning of up to 1.5 m/year is suggested to obtain a thick-limbed and multi branched shrub. Trees are commonly grown for their leaves, and topping-out is useful to keep an abundant supply of leaves, pods and flowers within easy reach. M. oleifera responds well to mulch, water and fertilizer. 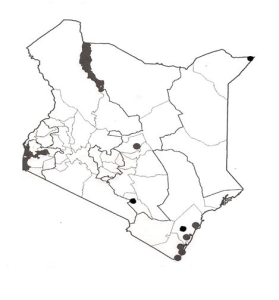 Growth is stunted in areas with a high water table. It coppices and pollards well. Food: The leaves, a good source of protein, vitamins A, B and C and minerals such as calcium and iron, are used as a spinach equivalent. They are an excellent source of the sulphur-containing amino acids methionine and cystine, which are often in short supply. Young plants are eaten as a tender vegetable and the taproots as an alternative for horseradish. Young pods are edible and reportedly have a taste reminiscent of asparagus. The green peas and surrounding white material can be removed from larger pods and cooked in various ways. Seeds from mature pods (which can be 40-50 cm long) can be browned in a skillet, mashed and placed in boiling water, which causes an excellent cooking or lubricating oil to float to the surface. The pleasantly flavoured edible oil, resembling olive oil, is an excellent salad oil. The flowers can be eaten or used to make a tea. Fodder: Leaves are mainly used for human food and not to any great extent for livestock, but branches are occasionally lopped for feeding camels and cattle. Apiculture: Its silviculture, involving regeneration by cuttings, coppicing and pollarding, keeps flowering on and off most parts of the year. This provides nectar to honey bees for a long period. Fuel: The soft and light wood is an acceptable firewood for cooking but makes poor charcoal. It has a density of 0.5 - 0.7 and yields approximately 4600 kcal/kg. Fibre: Bark, when beaten, produces a fibre used to make small ropes and mats. A study on the production of rayongrade pulp from M. oleifera by a prehydrolyzed sulphate process in India shows that it is suitable as a raw material for the production of high alpha cellulose pulp for use in cellophane and textiles. Timber: The wood is very soft and light and is useful only for light construction work. Gum or resin: When the tree is injured, the stem exudes a gum that is used in calico printing, as a condiment, and for stomach and bladder ailments. The mucilaginous gum has a bland taste and belongs to the hog series of gums. Tannin or dyestuff: Bark used for tanning hides and wood yields a blue dye. Lipids: Oil extracted from the mature pods (oil of Ben) is yellowish, non-drying, good keeping qualities but eventually turns rancid. It is used as a lubricant, in cosmetics and perfumes, and to some extent is a substitute for sperm-whale oil. 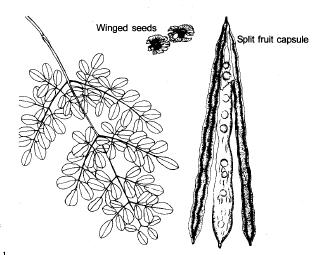 Medicine: Moringa seeds are effective against skin-infecting bacteria Staphylococcus aureus and Pseudomonas aeruginosa. They contain the potent antibiotic and fungicide terygospermin. The alkaloid spirachin (a nerve paralysant) has been found in the roots. Even when free of bark, the condiment in excess may be harmful. A decoction of the flowers is used as a cold remedy. The gum is diuretic, astringent and abortifacient and is used against asthma. Oil of Ben is used for hysteria, scurvy, prostate problems and bladder troubles. The roots and bark are used for cardiac and circulatory problems, as a tonic and for inflammation. The bark is an appetizer and digestive. The iron content of the leaves is high, and they are reportedly prescribed for anaemia in the Philippines. Other products: In the Sudan, powdered seeds are deemed more effective than slices of okra (Abelmoschus esculentus) for treatment of bee honey; they can be used without boiling and can also be used to clarify sugarcane juice. The crushed leaves are used to clean pots and pans, and the Hausa and Yoruba of Nigeria even use them to clean walls. Erosion control: M. oleifera is suited to areas where strong winds and long, dry spells occur simultaneously, causing serious soil erosion. Soil improver: The green leaves make a useful mulch. The press cake left after oil extraction from the seeds can be used as a soil conditioner or as fertilizer. Ornamental: The species is widely planted as an ornamental. Boundary/barrier/support: Planted as a hedge in courtyards, M. oleifera provides wind protection, shade and support for climbing garden plants. Widely used for live fences and hedges in Kenya, Nigeria, Tanzania, India, and elsewhere. Stakes root easily and are stable, and cuttings planted in lines are used particularly around houses and gardens. Intercropping: The tree provides semi-shade, useful in intercropping systems where intense direct sunlight can damage crops. Pollution control: Suspension of the ground seed of M. oleifera, the benzolive tree, is used as a primary coagulant. It can clarify water of any degree of visible turbidity. At high turbidity, its action is almost as fast as that of alum, but at medium and low turbidity, good clarification is obtained if a small cloth bag filled with the powdered seeds is swirled round in the turbid water. To prepare the seed for use as a coagulant, remove the seed coat and wings. The white kernel is then crushed to a powder, using a mortar or placing it in a cloth and crushing it with a stone. The powder should be mixed with a small amount of water, stirred, then poured through a tea strainer before being added to the turbid water. Pick mature (brown) capsules from the tree, dry in the sun, put in a bag and thresh with a stick. Separate seed and chaff by hand or by winnowing. Dry further in the sun for 3-5 days. Germination rate 60-70%. 4,000-5,000 seed per kg. Germination time ranges from a few days to more than 2 months, but usually quite fast. Seed can be stored for long periods. A tree which is easily propagated and recommended for homesteads for its food value. The "Ben oil" from the seeds keeps its quality and has been used to lubricate precision machinery like watches. It is also used as salad oil and in soap and cosmetics. The leaves are used as a vegetable while the young capsules (drumsticks) are a delicacy among the Asian community. The ground-up seeds can be used to clear muddy water, but all the purified water should be consumed in less than 24 hours or else bacteria could re-multiply. Immature seeds can be used like green peas. The wood is soft. Root bark contains poisonous alkaloids, so care should be taken in its use as a spice or medicine. It is said to cause dizziness. 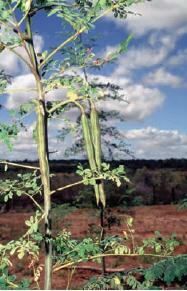 Moringa is a small genus with about a dozen members in Africa and Asia. Most species are form north-eastern Africa and western Asia. This tree is susceptible to attacks by the root rot (Diplodia spp.) and papaya powdery mildew (Levellula taurica). Eupterote mollifera (hairy caterpillar) causes defoliation but it can be controlled by spraying the tree with fish oil, resin soap or BHC.